This disc is really very special. Almost 80 minutes of music for unaccompanied violin might put off all but the most devoted listeners. but the CD's conception and performance. not to say its erudite booklet notes, all by the Cerman-born soloist. 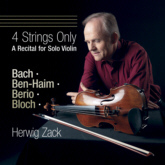 concertmaster and teacher Herwig Zack, create an exper.ience that grips from start to finish. Zack's playing is serious-minded, assertive and demonstrative, and he has a thrillingly flexible tone that ranges from the thin and piercing to the dark and brooding. He is generous yet unassuming, and it seems as though each note he plays is carefully considered, weighed, and delivered with a sincere intention. His intonation is immaculate, and his phrasing is a joy to hear. The Bach A minor Sonata is intense yet clear-headed: Zack is gloriously articulate in the Fuga's intertwining contrapuntal lines, yet he brings a restless energy to the dance-like demisemiquavers of the concluding Allegro. The two Bloch suites reveal Zack's more fantastical side: he's not afraid to rise to the drama of some of the writing, with huge swells of intensity and some finely controlled diminuendos, but he never overplays things. He shows off his wide-ranging tonal colours in the Middle Eastern-sounding sonata by Israeli composer Paul Ben-Haim, and the Berio Sequenza VIII bristles with fiery intensity. Recorded sound is warm and truthful.